Upstream a hundred miles or so from Hells Canyon, the deepest river gorge in North America, ruggedness gives to way to expansive vistas of gentler landforms rising along the twists and churns of the aptly named Snake River. Savvy wine lovers are fast discovering the Snake River Valley, an unexpected Idaho destination known for its well-made Rhône varietals, rieslings, tempranillos, and more in casual, welcoming tasting rooms — sprawled across a refreshingly rural setting. Visitors come for opportunities to explore and learn and feel and see how a place — Idaho! — puts its stamp on vitis vinifera. Millions of years ago, several cataclysmic events arranged and rearranged the Snake River Valley — flooding created massive ancient Lake Idaho, all that water drained, cutting through rock walls and leaving behind sedimentary layers, volcanoes erupted and lava flowed. Geologists fall in love with this kind of stuff — and so do farmers, vineyardists, and winemakers. The prolific valley, with its nutrient-rich soils, had been humming along, producing upwards of 150 different agricultural crops, when a few local fruit growers thought grapevines might thrive here, too. By the mid-1970s, starting with Ste. Chapelle, the state’s legacy winery, a nascent wine industry had taken root. Meanwhile the pioneering wine farmers here, as in any fledgling enterprise, experimented and moved along in baby steps, missteps and an occasional stride up the slippery slope, gradually gaining a foothold. Greg Koenig, who grew up tasting local stuff, returned home after collecting a degree in architecture, looking to produce something artisanal, high-end. Without a compass, he was one who forged the way. After Ste. Chapelle had settled in, he says, “a handful of producers came and went. All were very small.” Then, in the mid-1980s Indian Creek; Hells Canyon; and Pintler, now Sawtooth; came and stayed. Whites — chardonnay and riesling — proved to be winners from the get-go. So when Bitner wondered what to plant on those 15 acres he had been holding onto for a decade, his neighbor, who happened then to be the winemaker at Ste. Chapelle, suggested chardonnay. “What’s chardonnay?” Bitner recalls asking, laughing at the memory. Today, his vineyard is one of the state’s oldest and most celebrated blocks of this fan-favorite grape. And he has been actively helping the industry advance, particularly in education and at the intersection of farming and research. In 2010, with soil and other growing conditions seeming conducive, Bitner Vineyards added oak and hazelnut trees to the property, the rootstock of the trees inoculated with spores that produce French black truffles. It can take 10 years for the heavily perfumed fungi to mature — none has been sniffed out yet — but Idaho could add this pricey fancy foodie item to its crop slate (headed, always, by potatoes) someday. “Being a bee biologist was never my intention,” says Bitner, an international expert on pollinator management. 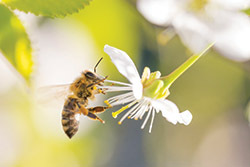 Yet, with guidance, especially from his Purdue mentor, John Osmun, then head of the Department of Entomology, Bitner took a shine to pollination — what bees do — which directly affects all of us since more than a third of everything we eat starts with a bee pollinating a plant. Graduate studies at Purdue developed his deep understanding of insect life cycles, particularly of bees, which became the underpinning of his work in agriculture. He studied nonhoney bees, focusing on nesting bees and wasps of Indiana. And that, wrapped into a master’s thesis, became a jumping off point. Around the time Bitner graduated from Purdue, the alfalfa leafcutter bee — first identified in the 1930s in Washington, DC, then absent from scientific records for several decades — was discovered in Idaho. A relationship between Bitner and the little leafcutters blossomed, starting with a doctoral dissertation. Leafcutter populations have propelled alfalfa seed production in Idaho and California to tops in the industry. “Alfalfa,” he explains, “is a multimillion-dollar forage industry for beef and dairy cattle that starts with planting alfalfa seeds pollinated by bees.” When pollination problems arose in Australia, he commuted back and forth, developing alfalfa leafcutter importation protocol for the Commonwealth Scientific and Industrial Research Organisation. At Bitner Vineyards, he farms sustainably, not organically (which often means using more chemicals than conventional farming). Although grapevines are wind-pollinated, cover crops planted between vineyard rows provide bee habitat. And leafcutter images adorn bottle corks. Mike Veseth (MS M’74, PhD M’75), blogs online at wineeconomist.com. Wine is art, science, craft, magic, and business, too. The wine business has a substantial economic impact in the United States and around the world. 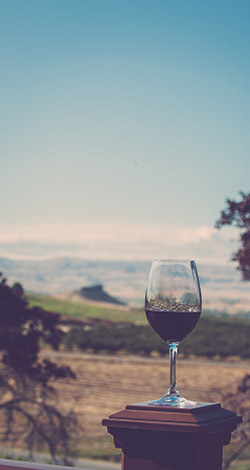 WineAmerica, a trade organization, estimates that the total economic impact of the US wine industry in 2017 was over $219 billion, with the industry in Idaho directly and indirectly supporting 7,361 jobs and generating a total economic impact of more than $886 million. What generates all this economic activity? Wine is fundamentally an agricultural product that requires skilled labor, specialized equipment, and many other associated vineyard services — such as trained raptors to keep birds out of vineyards when harvest nears. Additional economic impact comes from enology and viticulture research and extension services personnel to support vineyard improvement and operational efficiency. Purdue’s College of Agriculture is a leader in this field, supporting Indiana’s wine industry. Wine tourism and hospitality are another important source of wine economic activity. Winery visits allow producers to make full-price direct sales. With production costs rising faster than retail prices for many wineries, direct sales are increasingly the name of the game, and wine tourism is a key profit center. Winemaking requires a substantial investment in equipment including tanks, barrels, and bottling lines. Wine businesses, like all others, also need legal, insurance, and financial services. Because the beverage alcohol sector is highly regulated, compliance services are needed as well. 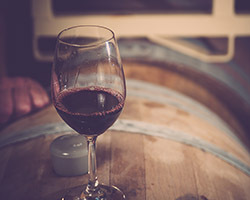 Local wine industries create jobs growing grapes, selling them, trucking them, making wine, testing the product during and after fermentation, providing bottles, corks, and labels, wholesaling, and retailing the wine. The produce chain from vineyard to your glass adds value in each step. Nearly all Idaho wine is sold from tasting rooms. Go urban in Garden City on the hike/bike Greenbelt along the Boise River or rural (easy driving) on the Sunnyslope Wine Trail in the Nampa-Caldwell area. Earl Sullivan had an international career in pharmaceuticals; Carrie Sullivan was a veterinarian. In 2008, they launched a family business, making 50 cases of Idaho wine. Turas, a syrah-based blend meant to age, is the flagship wine. They vinify other reds, including petit verdot, but not cabernet sauvignon. Leslie Preston salutes the mighty influence of the river, with its bends and curlicues, naming her label Coiled. Besides syrah, she has branched out to tempranillo and riesling, including a very personally styled, classic-method sparkling riesling, Rizza. Melanie Krause loves how volcanic soils intensify flavor of viognier, tempranillo, and syrah. Cinder remains can be seen in vineyard earth. An ambitious lineup ranges from the everyday Laissez Faire label to high-end reds — the cabernet sauvignon blend comes from 35-year-old vines. Jed Glavin, a self-described RhÔne guy, loves experimenting. The white blend for Exploding Mirror varies annually; varietals for his rosés change too. Glavin wishes riesling wasn’t so misunderstood (it’s not always sweet! ), sells wine in growlers and kegs — and does it all in an intimate, friendly, funky space. Greg Koenig, who comes from an Idaho hospitality family, produces a notable cabernet sauvignon with Fraser Vineyard grapes grown at the highest point in the county. A love of Italian vernacular architecture inspired his winery design, constructed with local sandstone accents. Martin Fujishin, from a local agricultural family, started out working for Greg Koenig. By 2009, he opened his own shop. He likes for wine to be a learning experience and sometimes offers classes or special tastings. “Tempranillo and syrah are slam dunks for Idaho.” He likes “playing with” odd balls such as mourvèdre. Ste. Chapelle’s hillside octagonal tasting room mimics the medieval French original. As Idaho’s research and volume leader, it has the widest-ranging lineup: Chateau series (that pretty pink is riesling with huckleberries); Snake River Valley series (great for sampling varietals); and top-shelf Panoramic and Treasure Valley series. 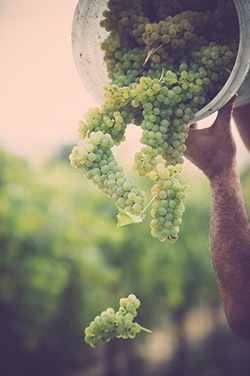 Bitner wines have been standard-bearers for chardonnay and riesling since the 20th century. Wife Mary and daughter Amy joined Ron on the Bitner team when, instead of selling most of the crop, they began producing and bottling themselves. In 1998, the fourth-generation homesteading Williamsons decided to tap their fruit-growing expertise and planted vinifera on part of their 400 acres. First in the valley to grow sangiovese, they focus on a fruit-forward style. Cabernet sauvignon, petit syrah, and Harvest Moon Red, a red blend, offer proof. Everything about this brand evokes the enticing, vast, and rugged Idaho outdoors. Meredith Smith produces a gewürtztraminer only in years when “those incredible aromatics are just right.” Trout Trilogy series — carmenere, grenache, malbec, tempranillo, petit syrah, syrah — is sold exclusively at the winery.